Honeybees are interesting creatures. They are social and cooperative insects that work together in a harmonized environment. Honeybees are hardworking creatures, pollinating our flowers and creating honey that humans crave. But how are such small and busy insects able to control their flight while being able to dodge obstacles? It has been determined that honeybees have a dorsal visual field. For such tiny creatures it allows them to be able to avoid obstacle from above. Although this is a known fact among the scientific community, it has been unclear whether this dorsal visual field allows for them to be able to control their flight speed. Until researchers from the Institut des sciences du mouvment conducted studies over the honeybees and confirmed for the public that it does control their flight speed according to obstacle proximity, whether it is in the horizontal or vertical plane. They use perceived optic flow from overhead to achieve this feat. The picture to the left demonstrates a honeybee adjusting its flight speed in order to navigate its way through a very complex setting. Scientists were baffled and tried to understand how a bee, such a small and simple creature is able to do such an amazing feat. We understand now that a bee’s sensory-motor performance depends on a nervous system that consists of millions of neurons. As the bee flies, the image of the environment gets transferred from the front to the back of its visual field, thus creating an optic flow, which is defined in the article “How Do Honeybees Control Their flight Speed to Avoid Obstacles?”, as “the angular speed of the environmental contrasts passing [through] its visual field.” Optic flows by definition are strongly dependent on the relationship between speed and distance. 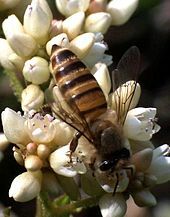 In order to be able to study these creatures, the researchers developed a honeybee flight simulation model, called ALIS. Through ALIS the researches were able to conduct experiments on the bees and observe them in a controlled environment. ALIS is capable of reproducing insect trajectories by utilizing computer-processed visual data. 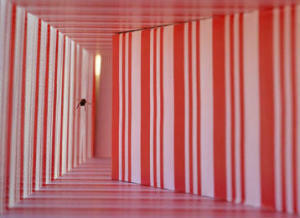 They found a bee’s speed to decrease whenever it came close to an obstacle. Thus the researchers concluded that the bee’s flight speed changes depending on the proximity of a nearby obstruction. The fact that bees can control their flight speed is something quite extraordinary. What may seem simple and an everyday matter for them requires hundreds and thousands of money and research to be able to control our airplanes and rocket’s speed. In the article, “the scientists point to the existence of controllers to maintain the optic flows.” It triggers a “cruise control” method whenever the animal is flying in a crowded environment and helps maintain the speed and distance. 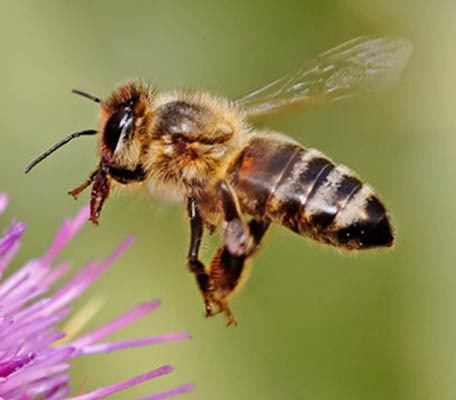 Our own aerospace sensors do not stand a chance against a bee’s ability to control its flight speed by being able to use its dorsal visual field. What humans create a bee can simply do. This research can lead to groundbreaking discovery in being able to assist the aerospace field. It can allow for the development of an aircraft that is sensitive to flight in a closed and confined environment. It is amazing to think how such a small honeybee, which may seem very insignificant to many us, can have such highly advanced maneuvering skills. This is a very interesting topic—how small flying animals use optic flow to maneuver in cluttered environments. There is a lot of very interesting research going into this, as it is very relevant for small robotic flyers.